After integrating with Sigfox and Things Connected we are now delighted to announce our partnership with The Things Network (TTN), the blazingly fast-growing, community-driven LPWAN provider. Just like Things Connected and Sigfox, The Things Network offers low-power connectivity for devices. As of today, users of The Things Network can seamlessly manage their devices in the EVRYTHNG cloud platform. Where does LPWAN fit in? You might wonder: why haven’t we seen more Internet of Things (IoT) initiatives to monitor our environment or supply chains? Key to building IoT applications is easy access to wireless network connectivity. In the smart home, protocols such as Wi-Fi and Bluetooth are readily available, but for other deployments such as those in rural areas or along the supply chain, you cannot easily rely on a WiFi or Bluetooth network. And even if you could, the power consumption of such protocols might be a no-go for devices needing to run for months or years on a single battery. All of this is rapidly changing thanks to Low Power Wide Area Networks (LPWAN) such as Sigfox, NB-IOT and LoRa. Within this LPWAN space, a quiet revolution is taking place to democratize LPWAN connectivity and unleash a wave of citizen-driven IoT innovations. While LPWAN technologies are a good fit for monitoring our environment or pallets and containers along the supply chain, it is also worth noting that LPWAN technologies are also increasingly being used to deploy devices in smart homes and buildings, replacing for instance SIM card-based (3G) smart meters. While they do not support data intensive applications, their advantage over technologies such as WiFi or Bluetooth is that they require no configuration: just drop the device, start it, and it connects to the nearest LPWAN gateway! The Things Network and its thousands of crowd-sourced gateways worldwide. The Things Network is a community-based, global initiative to provide free LPWAN coverage over LoRa. As of July 2017, The Things Network already spans 20,947 communities in 89 countries, with thousands of gateways providing LPWAN access across the world. LoRaWAN coverage is entirely crowdsourced. Members also contribute by providing support or through software development. We are thrilled that EVRYTHNG is now an official partner of The Things Network. 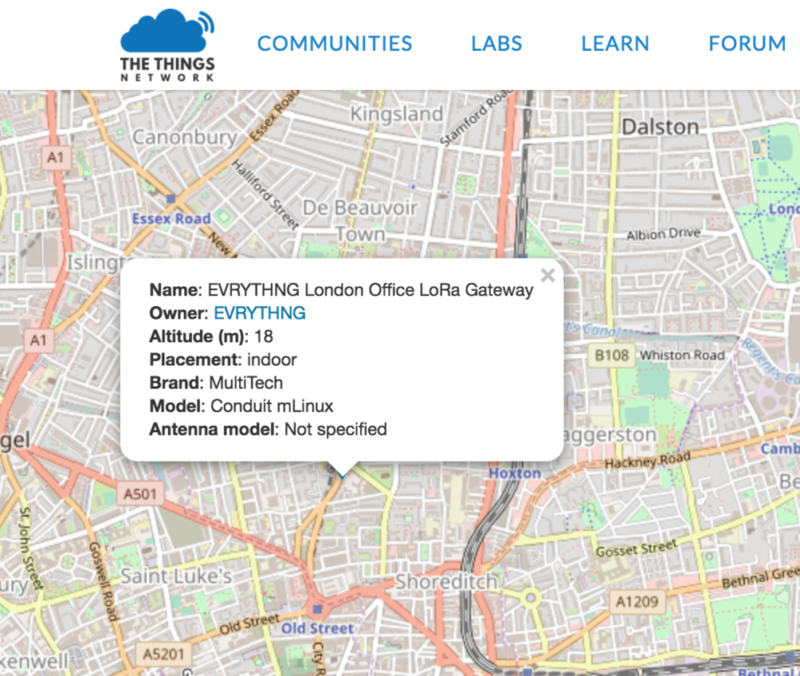 Being at the forefront of the IoT community and technology, we already installed our first The Things Network LoRa gateway in our London office, and our New York office is next! The Things Network gateway alive and kicking in the EVRYTHNG London office. We have developed a dedicated service to seamlessly integrate a device connected to The Things Network to the EVRYTHNG cloud, meaning that you can now also power the identity, intelligence and analytics of your TTN devices via the EVRYTHNG IoT Smart Products Platform. The Things Network gateway gets a digital identity and web API on the EVRYTHNG platform. If you already have an account with The Things Network, we encourage you to give our integration a try (through our free tier) for your next prototypes. You’ll find a short technical how-to at https://developers.evrythng.com/docs/the-things-network. Thanks to its increasing coverage, we are seeing more and more commercial applications now using The Thing Network. Please get in touch with us to see how this technology could help your next smart supply chain or smart home project.